The information contained in this online hub is not provided as advice or as recommendations. The information is intended as a general guide only. It does not take into account your personal circumstances and may not be relevant to you or be fully up to date. You must rely solely on your own external and independent advice. The information provided should not take the place of information or advice available from, or provided directly by, relevant Government bodies, including the National Disability Insurance Agency (NDIA) and the NDIS Quality and Safeguards Commission (NDIS Commission). 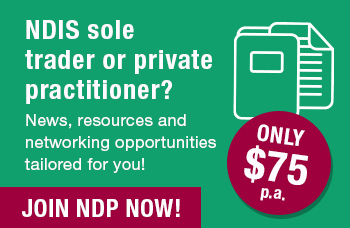 While we endeavour to keep advice up to date and correct, National Disability Practitioners (NDP), a division of National Disability Services Limited (NDS), cannot be held responsible for the accuracy of the information, or any other matter arising out of the use of the information appearing on the site. The ‘NDIS & Sole Traders’ project is funded by the Industry Development Fund, delivered by National Disability Services on behalf of NSW Department of Family and Community Services: Ageing, Disability and Home Care.